The Winter 2003 issue of the Newsletter of the Print Club of New York, Inc. directed members to a review by Hilton Kramer in the December 2, 2002 issue of the New York Observer of Resika’s fall show at Salander-O’Reilly Galleries. Resika (b. 1928) studied with Hans Hofmann as a teenager. He also spent three years studying in Venice, Italy. In his review, Kramer noted that as a colorist, Resika is “now without peer in his own generation, a generation that has often made color its most important pictorial interest.” The artist has won numerous awards and honors including a Guggenheim in 1984 and the Benjamin Altman Landscape Prize from the National Academy of Design in 1997. He holds membership in both the American Academy of Arts and Letters and the National Academy of Design. Resika’s work and career both reveal great complexity. He has taken a variety of points of departure, from Venetian painting, to French 19th century art and European (and American) modernism. 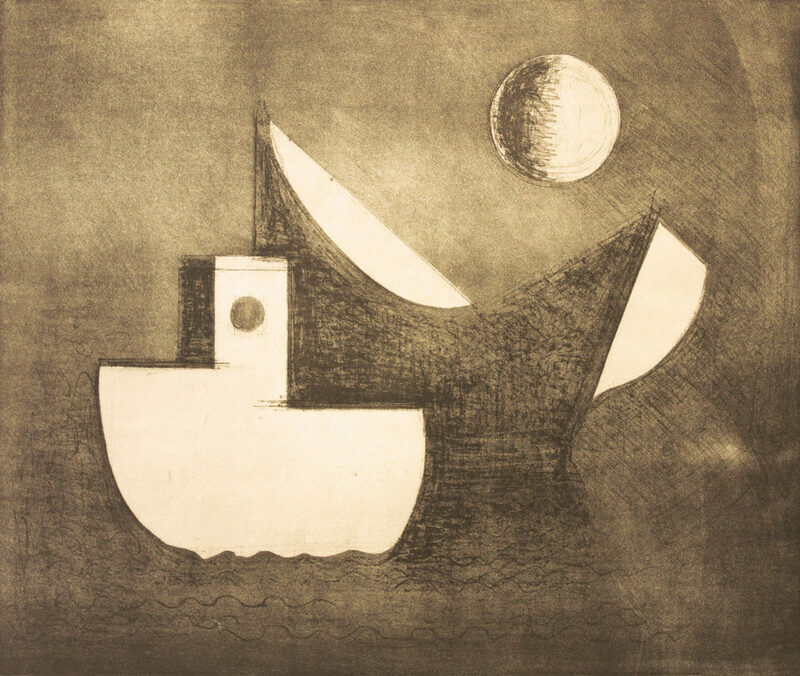 Painter and author David Carbone has seen these explorations as “intimate conversations…between artists.” The theme of the boat, the subject of Resika’s 2001 Presentation Print, a black and white soft-ground etching titled Still Boats and Moon, has been a recurring one in the artist’s oeuvre. Poet and art historian David Shapiro has called them “soul-boats,” referring to the long tradition of boats as conveyors of souls. The subject is one that the artist, who lives in Provincetown, has not yet exhausted. Boats and Triangles (2002), a recent painting, shows Resika still exploring the delicate boundary between plein air painting and geometric abstraction.